As mentioned previously, the Christmases of my youth were spent sleeping over at my grandparents’ house. This memory comes from what Wikiepedia assures me was 1987 — which simultaneously seems like moments ago and an eternity back. I had just turned 15, and was suffering from that terrible curse of teenagerdom where you are worried that it is kind of lame to be spending time with the people who love you best and wishing you were somewhere else. One of the tragedies of our lives is how much we miss out on because we think there’s something more interesting happening wherever were aren’t; it is a lesson always learned too late. 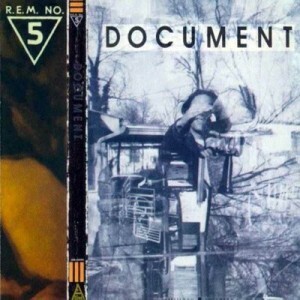 In any event, the thing I wanted most that Christmas was R.E.M.’s Document, which had come out in the fall. My grandmother, who had wisely given up on making guesses as to what to get me, had dutifully gone to the record store — remember those? — in the strip mall near her retirement community and picked it up. I knew immediately that it was there when I looked under the tree. The shape of the longbox — remember those? — gave it away. My grandparents were wonderful people, but they were old. They did not, in 1987, have a CD player, and I don’t believe they ever wound up getting one before they passed. So there was no way I was going to be able to listen to the album until the next day. Older readers may have similar stories, but this is what I remember: lying flat on the ground near the Christmas tree, staring at the box and the liner notes under its lights. As my grandparents puttered around cleaning up, I played the songs I knew in my head and tried to imagine what the other ones would sound like through their titles and the deliberate obscurities of the packaging. (I’m vague on this one, but I believe the box had some kind of legend like “File Under Fire” or something on it.) Occasionally my grandmother would offer me some tardelle, and I would decline, fearing that the honey would stick to my fingers and mar my precious new present. It was warm, it was quiet, it was pleasantly dusky; it was Christmas. Obviously this is a story that would not happen today. I would have been sitting in the corner listening to the whole thing on my iPod, walled off from everyone else in the house and missing the stray bits of conversation that would waft through my reverie. I’m not making a judgment here or saying Things Were Better In My Day; it is what it is. We all make our own memories one way or another. In any event, I am wishing that each and every one of you have some sort of enjoyable event over this holiday; that you cherish the people you love and manage to tolerate the ones you don’t. I find that alcohol helps, but as the flashback above hopefully illustrates, it is not always necessary. Merry etc.